Make the Memorial Drive Greenway Better for Bikes! The Memorial Drive Greenway is slated for a major redesign affecting both the roadway and parkland. Help us ensure cyclist safety is a key consideration in the final plan! Thursday, April 11 // 6:30 p.m. – 8:30 p.m.
On Thursday, the Department of Conservation and Recreation (DCR) will host the first public meeting on Phase III of a massive effort to modernize Memorial Drive. This phase, part of the 2002 Charles River Basin Master Plan, covers the stretch from the B.U. Bridge to the Eliot Bridge. As the kickoff meeting for this phase, now is the best time to share your thoughts with DCR on where upgrades are needed — to improve the path, the corridor, and theintersections that serve as nodes connecting the bridges between Cambridge and Boston — for people who bike. This greenway is a key component of Metro Boston’s bike network. 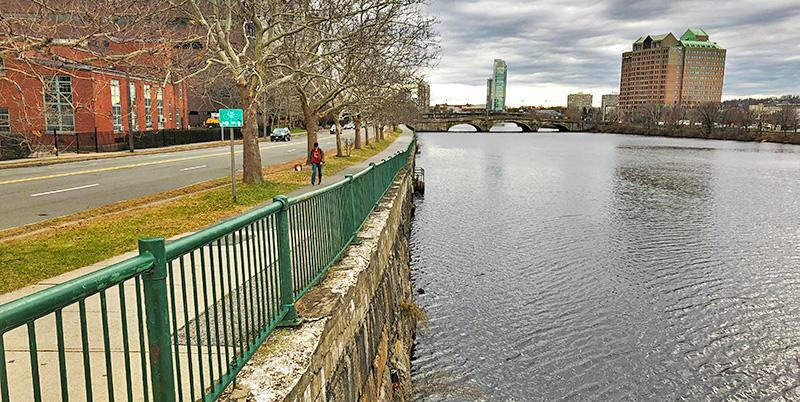 It sees some of thehighest bike trafficin the area, and provides a safe route to bridges across the Charles River. With bike ridership booming — Somerville and Cambridge now rank 5th and 6th, respectively, among all U.S. cities in terms of bike commute mode share — the greenway could use some significant upgrades to accommodate all the new riders. Widening the path — Planning guides recommend a width of at least 10 feet for bidirectional multi-use paths, and stretches of the path fall well short of that minimum. We also encourage you to tell DCR what changes would make YOU feel safer! Show up and speak up — The most impactful thing you can do is attend this kickoff meeting to show DCR how many people this project impacts. Attending the meeting also gives you the opportunity to share your concerns and goals directly with the agency. Submit feedback online — If you can’t attend, you can still provide feedback via DRC’s online form here. Stay informed — We’ll send updates about this project as it progresses, but you can also sign up to receive notices directly from DCR by emailing Mass.Parks@state.ma.us and asking to be added to the project’s mailing list. We hope to see you Thursday night. Don’t miss your chance to shape the future of this important bike corridor!